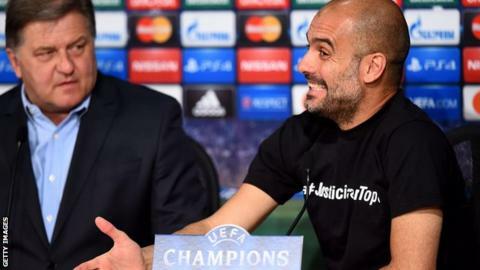 Bayern Munich manager Pep Guardiola has been charged by Uefa after wearing a T-shirt demanding justice for a reporter who died at the 2014 World Cup. He displayed the "#JusticiaParaTopo" slogan at a news conference on the eve of Tuesday's Champions League quarter-final win over Porto. European football's governing body has charged the Spaniard over an "incident of a non-sporting nature". The Justice For Topo campaign wants an investigation into Topo Lopez's death. Argentine journalist Jorge Lopez, known as 'Topo', was killed in Guarulhos, Sao Paulo in July in a road traffic accident during the World Cup in Brazil. It is against Uefa regulations to display non-sporting "manifestations". Meanwhile, Porto boss Julen Lopetegui has also been charged for his conduct during Tuesday's game. The Spaniard was dismissed from the touchline in the 6-1 loss to Bayern, which resulted in a 7-4 aggregate defeat for the Portuguese side.